Frederick Auto Body is a family owned, full-service collision center located in the heart of downtown Frederick Maryland. Our local Auto Body Repair Service offers a host of auto body repair, auto collision repair services. We are dedicated to 100% customer service and high quality automobile repairs. Frederick Auto Body is a family owned, full service collision center located in the heart of downtown Frederick Maryland since 2004. We repair all makes and models of cars and trucks, no job is too big or too small! At Frederick Auto Body, we treat each and every vehicle like it is our own, our attention to detail and high quality repairs bring your car back to better than per-accident condition. 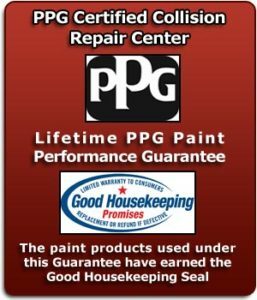 We work with all insurance companies, and offer a Lifetime warranty on all paint and body work. Our quality of repairs is only exceeded by our customer service and attention to detail! When I got in an accident my insurance company sent me to another body shop in Frederick, but after asking my around I decided to take my car to Frederick Auto Body instead – and boy am I glad I did! Kevin and Will in the office were treat to work with, they had my rental car waiting for me and took care of all the details with my insurance company. But the best part was when I came back and saw my car after it was fixed – it looked better than when I bought it! I will NEVER take my car to any other body shop, these guys are THE BEST! The team at Frederick Auto Body are awesome! My vehicle was recently the recipient of a hit and run in a parking lot. Kevin and his team did an excellent job repairing the damage to my vehicle. You would never know the accident ever occurred. They were courteous and the job was completed on time and my vehicle was returned in a clean and neat condition. I highly recommend Frederick Auto Body should you need their services. It’s rare to get such reliable, fast, and friendly service as I experienced at Frederick Auto Body. The manager, Kevin, has years of experience in auto salvaging and custom body work. Getting auto repairs done is typically a hassle and leaves the customer second guessing. Frederick Auto Body works on the customer’s schedule and provides quality work at an affordable price. My car got hit while it was parked. The entire side was crushed in. I had it towed over to the shop where Will and Kevin took great care of it. They were great, dealt with my insurance and kept me in the loop the whole time. The car looks just like new and drives great! I would highly recommend them. The car was done on time and delivered as promised! By far the best experience I’ve ever had dealing with an auto body shop. Kevin and Will were very personable and professional. They delivered exactly what was promised and made my car look great. I appreciated the fact that there was no attempt to sneak additional add-ons into my estimate or final tally. Great experience from start to finish. I wouldn’t hesitate to recommend this business. Excellent service and affordable pricing. the car looked like new when I picked it up. I went to a few places for quotes and this one was by far the most reasonable and the people were the most friendly. Very happy and would recommend to anyone. My husband took his BMW to Will and Kevin after a recent accident. The two of them were great! From working with the insurance companies, to having the work completed in the timeframe that they estimated, to the quality of work was first class!